This enormous monstrosity is the first floating nuclear power plant built in the world. And now it’s heading to the Arctic. No, it’s not a joke or science fiction, it’s really happening. 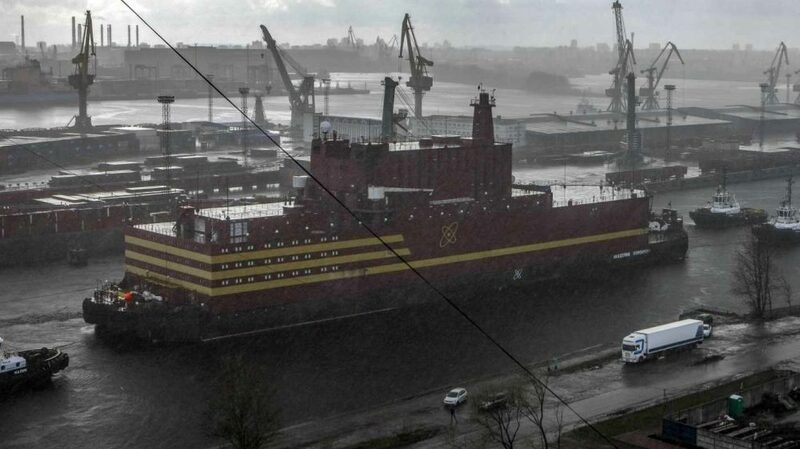 Rosatom, Russia’s state-controlled nuclear giant, has just launched the Akademik Lomonosov, the first of a fleet of floating nuclear power plants that Russia plans to build and sell to other countries such as China, Indonesia and Sudan. It is currently being towed across the Baltic Sea, where it will travel all of Scandinavia to Murmansk, to be supplied and tested, before departing on a 5,000 kilometre trip through the Arctic. Rosatom has said that the plant “is designed with a large margin of safety that exceeds all possible threats and makes nuclear reactors indestructible in the face of tsunamis and other natural disasters.” Remember what happened the last time they said a boat was “unsinkable”? Nothing is indestructible. The problem is that this nuclear Titanic has been built without independent experts to verify it. The same lack of supervision that there was in Chernobyl. The flat bottom hull of this plant makes it especially vulnerable to tsunamis and cyclones. A large wave could launch the station to the coast. Also, he can not move alone either. If you release moorings, you can not move away from a threat (such as an iceberg or a strange vessel, for example) increasing the risk of a fatal incident. A collision shock would damage your vital functions, causing a loss of power and damaging your cooling function. There are so many things that could go wrong here: it could flood, sink or run aground. All of these scenarios could lead to the release of radioactive substances into the environment. In case of a collapse, the ocean water would cool the core. It may seem like a good idea, but when the fuel rods are melted with seawater, there would first be a water explosion and possible explosions of hydrogen that would propagate a large number of radioactive isotopes into the atmosphere. Damage to the reactor could contaminate much of the marine wildlife that is nearby, which means that fish populations could be contaminated in the coming years. The radioactive Arctic is not the most beautiful scenario. The areas around Fukushima and Chernobyl are already difficult to clean, imagine in the polar night, with sub-zero temperatures and snowstorms. In Russia, there is a very long list of accidents with nuclear submarines and icebreakers. Rosatom’s plans to build a fleet of floating nuclear power plants pose an increased risk of unprecedented nuclear accidents in the Arctic. We already have enough radioactive waste without knowing what to do with them. We do not need more. The reactors of this plant are smaller than those found in a nuclear power plant on land and will need to be refuelled every two or three years. The radioactive waste will be stored on board until it returns after the designated 12 years of operation. That means radioactive waste will be left floating in the Arctic for years. This is not only incredibly dangerous, but there is still no safe place to transport the fuel used once you step on firm ground. No source of energy must generate waste that takes thousands of years to be safe. If this floating nightmare were not already absurd enough, the reason they are towing it to the Arctic is to help Russia extract more fossil fuels. Its main mission is to provide electricity to the northern oil, gas, coal and mineral extraction industries. And it is not necessary to repeat the reasons why more fossil fuels are synonymous with more climate change. We only have to protect the Arctic from this potential catastrophe.